More coming soon. Working on something cool. Backyard stargazers get a monthly guide to the northern hemisphere’s skywatching events with “Tonight’s Sky.” Backyard stargazers get a monthly guide to the northern hemisphere’s skywatching events with “Tonight’s Sky.” (Musical track The Far River written by Jonn Serrie, from the album And the Stars Go With You courtesy of New World Music Ltd). 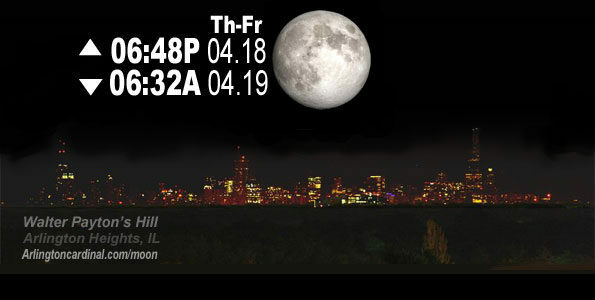 Photo information: Composite Photoshop image from one photograph of the Moon and one photograph of the City of Chicago skyline from Payton Hill in Arlington Heights, IL. Telephoto lens, ISO 100, f/11, Shutter Speed 1/100 to 1/125 for the Moon. Telephoto lens, ISO 1600, f/11, Shutter Speed 2.5″ for the skyline. The skyline exposure was toned down, and brightness and contrast was adjusted in Photoshop.